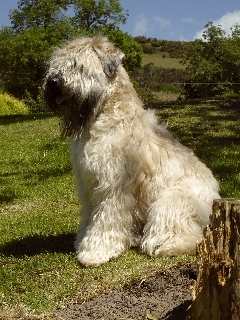 The Soft-Coated Wheaten Terrier is a medium sized, exuberant and fun-loving dog. He is typically very sociable and like all terriers has a mind of his own. He is a family dog who wants to join in with whatever is going on. He is sturdy and active and responds well to obedience training. Daily grooming of his longish, soft coat is necessary. 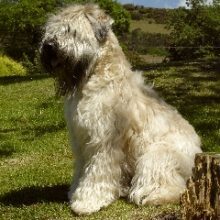 Long hair around the Wheaten’s face will cover his eyes if not kept thinned. Blood test for normal kidney function (breeders are recommended to blood test breeding stock and pups).